Primare launches networked Prisma I35 amplifier and CD35 player | What Hi-Fi? The Swedish specialist has started shipping its first Prisma models. 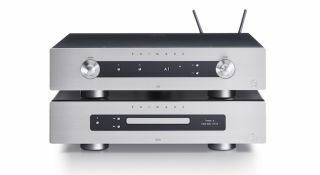 Both the I35 Prisma integrated amplifier/network player and CD35 Prisma CD/network player are based around Primare’s new Prisma wireless multi-room network module that offers playback from stored and streamed music over wi-fi, as well as Bluetooth connectivity. Why Prisma? “Just as a prism provides a complete spectrum of colours from a single point of light, Prisma provides a complete spectrum of system management from a single point of control,” said Terry Medalen of Primare marketing. In this instance that point of control is the supplied C25 Primare system remote. The I35 Prisma integrated amplifier is the first product to make use of the second generation of Primare’s UFPD Class-D power system, which Primare claims is a ‘radical reworking’ of the original, and delivers 150 watts per channel (into 8 ohms). In addition to balanced and unbalanced analogue inputs, the 135 Prisma has seven digital inputs – four optical, two coaxial and an asynchronous USB – as well as a coaxial output. It features a DAC that’s capable of 768kHz playback and DSD 256 conversion. The CD35 Prisma CD player couples a TEAC CD drive with a 384kHz/DSD 256 DAC fed by optical and coaxial inputs - there's a balanced analogue output stage too, completing what Primare claims is the best CD player it has ever offered. Both players are available now in black or titanium finishes, and can be purchased with or without the Prisma module. The I35 is priced £4000 with, or £3700 without - and there’s also the option to buy the amplified network player without Prisma or the DAC for £3200. The CD35, meanwhile, costs £2900 with Prisma and £2550 without. Thanks to the players’ modular nature, those that forego the features can add them at a later date.